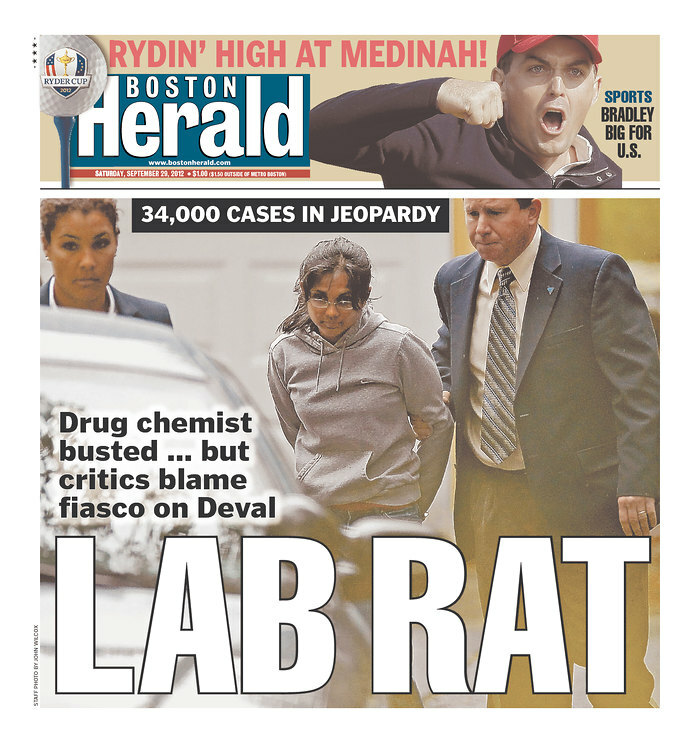 The Massachusetts State Police Drug Lab kerfuffle produced very different front-page coverage in Saturday’s local dailies. Check inside for further details. Elizabeth Warren’s soi disant Native American heritage has drawn fire not just from incumbent Sen. Scott Brown, but also from Native Americans. Except it’s hard to know that from the Boston Globe coverage. The principal chief of the Cherokee Nation denounced Senator Scott Brown’s campaign staffers on Wednesday for what he called offensive and racist behavior against Native Americans, and he called on Brown to apologize. A day earlier, Democrats released a video filmed outside a Brown campaign event showing Republican staff members, including an aide in Brown’s Senate office, performing tomahawk chops and shouting war whoops amid a crowd of boisterous supporters of both candidates. 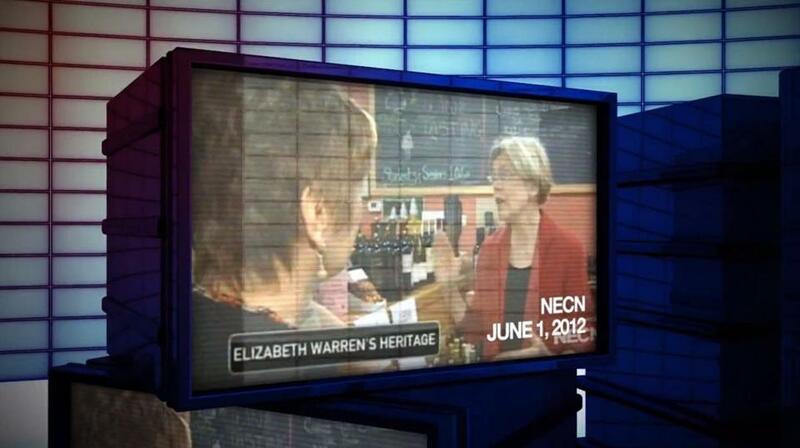 The gestures appeared to mock Elizabeth Warren’s professed Native American ancestry. [Sen. Brown’s] campaign also released a comment from a member of the Pequot tribe calling Warren a fraud for her undocumented claims of Native American ancestry. U.S. Sen. Scott Brown delivered his “one and only warning” to staffers about their behavior after a video captured tomahawk-chopping supporters, but while a top Cherokee official demanded Brown apologize, other Native Americans said they’re still waiting for Elizabeth Warren to admit she’s no Cherokee. Fake heritage, fake issue, fake outrage – take your pick. The fall television season is upon us, which means the return of familiar shows and the debut of new ones. It also means TV reviews, to see which one are worth watching. Or not, if you read both local dailies. Case in point: the ABC’s new drama series Last Resort. There’s no question in my mind that most TV sci-fi dramas have some precedent in “The Twilight Zone.” Rod Serling’s stark, brilliant anthology series, which ran from 1959-63, messed with all kinds of cosmic possibilities – about existence, about childhood, about time and space, about good and evil, about politics, technology, and the future. There were humans, aliens, robots, mutants, dreams, and apocalypses, the last of which are particularly popular these days in primetime. 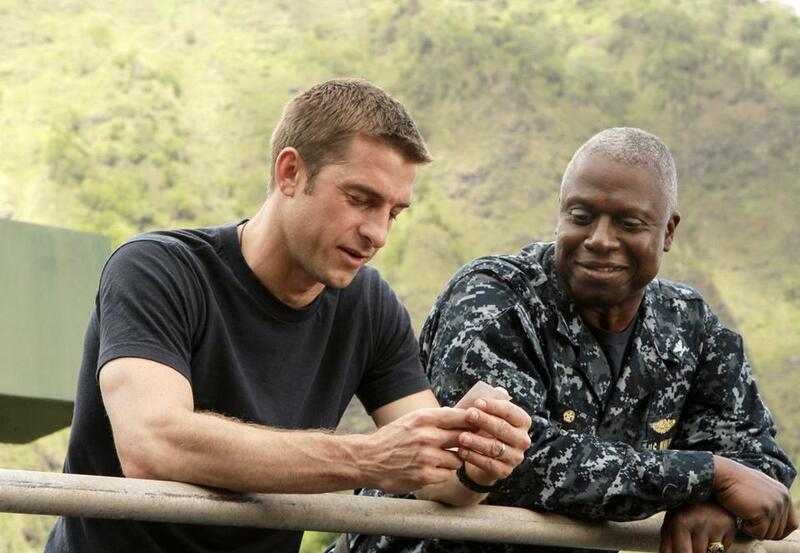 From “Lost,” “FlashForward,” and “Fringe” to “Revolution” and ABC’s fascinating new “Last Resort,” TV is still toying with the what-ifs and watch-outs explored in TV’s great uber-ancestor. But the Herald’s Mark Perigard? Not so much. 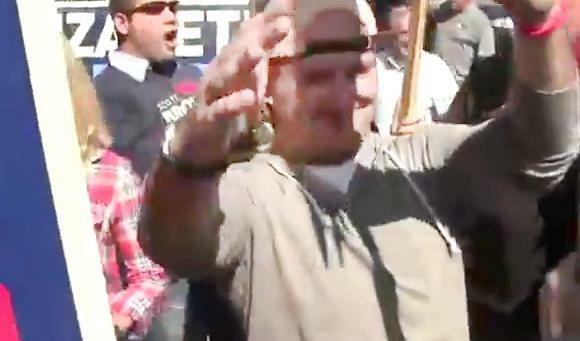 An anti-Muslim video created by an idiot and posted to YouTube has provoked violence worldwide. Tonight, a commercial network releases an expensive-looking drama that casually drops two nuclear bombs on Pakistan and obliterates millions — off-screen, thankfully. Our “hero,” late in the hour, detonates a nuclear bomb on American soil — just to prove a point. To be fair, “Last Resort” does not insult ideology — it merely knocks your intelligence. Anybody got a coin we can flip? 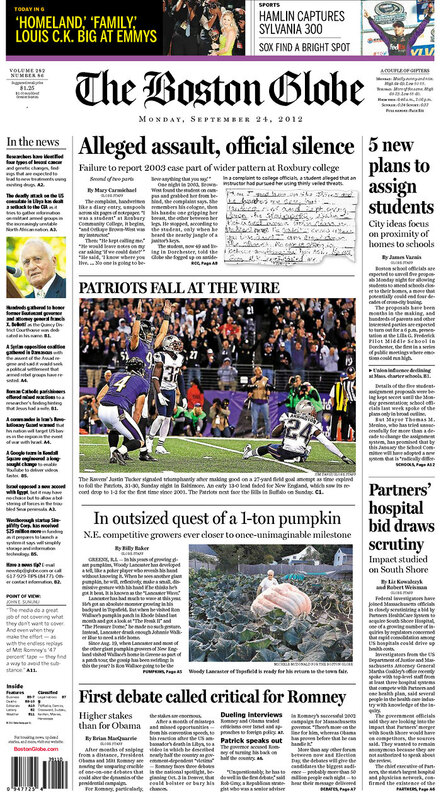 Yesterday’s rally shenanigans by staffers of Sen. Scott Brown (Whomp ’em) went straight to the front page 0f today’s Boston Globe. In a tough new ad and in his attacks at last week’s debate, Senator Scott Brown has stoked questions about Elizabeth Warren’s professed Native American ancestry. But the difficulty of seizing on the controversy without crossing into uncomfortable racial territory became apparent Tuesday with the release of a video showing Republican staff members, including an aide in Brown’s Senate office, performing tomahawk chops and war whoops outside one of his campaign events. Brown said such behavior is “not something I condone,” but declined to apologize. “The apologies that need to be made and the offensiveness here is the fact that Professor Warren took advantage of a claim, to be somebody, a Native American, and used that for an advantage, a tactical advantage,” Brown said. Warren on tomahawk chop video: Cut it out! “I think everyone knew what he was up to,” said Warren, who has been dogged by a growing scandal over her unsupported claims of Cherokee heritage and her professional claims of minority status. This isn’t going to get any prettier, folks. The Naive American – sorry, Native American – heritage of Elizabeth Warren continues to be batted around in the local dailies today. Boston Herald columnist Margery Eagan tells Warren running for office means always having to say you’re sorry. Here’s what might help Elizabeth Warren in this oh-so-close U.S. Senate race: some apologies, some mea culpas. Yesterday during an interview with Jim Braude and me on News Talk 96.9, Warren was asked — yet again — about the issue that just won’t go away. “Do you feel that guilt that you checked the box?” asked a caller from Wellesley, who admitted that she, too, had checked the Native American box when pursuing a government job in the ’80s, and still feels bad about it. Had Warren said what she should have said when the Herald first broke the Native American story months ago, it wouldn’t be a big story anymore. That is, that she regretted checking her own Native American box. That it was a mistake. That she was sorry. US Senator Scott Brown and his Democratic rival Elizabeth Warren launched dueling ads Monday over her claims of Native American heritage, an issue that has provoked the most serious personal attacks in their race. At the conclusion, a reporter asks Warren: “Is there anything else that’s going to come out about you that we don’t already know?” The Democrat laughs in response. “You know, I don’t think so, but who knows,” she says . . .
Well, we all know about it now. And it’s not going away anytime soon. 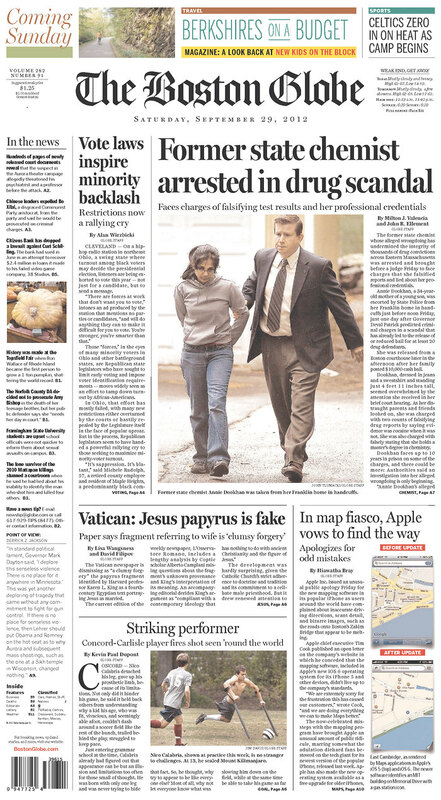 Both local dailies front-page debate stories today as campaign season shifts into high(er) gear. After months of sniping from a distance, President Obama and Mitt Romney are nearing the unsparing crucible of one-on-one debates that could alter the dynamics of the presidential campaign. 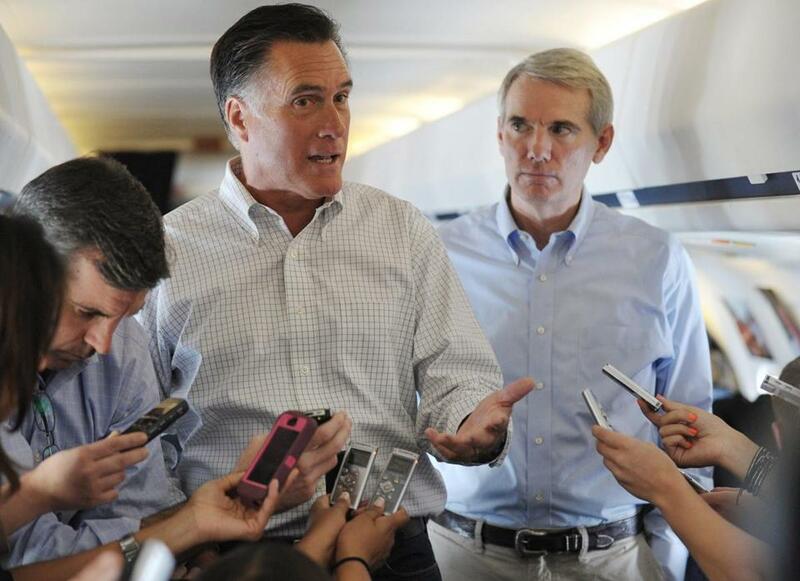 For Romney, particularly, the stakes are enormous. After a month of missteps and missed opportunities — from his convention speech, to his reaction after the US ambassador’s death in Libya, to a video in which he described nearly half the country as government-dependent “victims” — Romney faces three debates in the national spotlight, beginning Oct. 3 in Denver, that could bolster or bury his chances. He’s not Mitt Romney, but he got to play one in debate practice. And he says the real Mitt needs to resurrect his personable performance from 10 years ago to beat President Obama in their upcoming face-to-face showdowns. 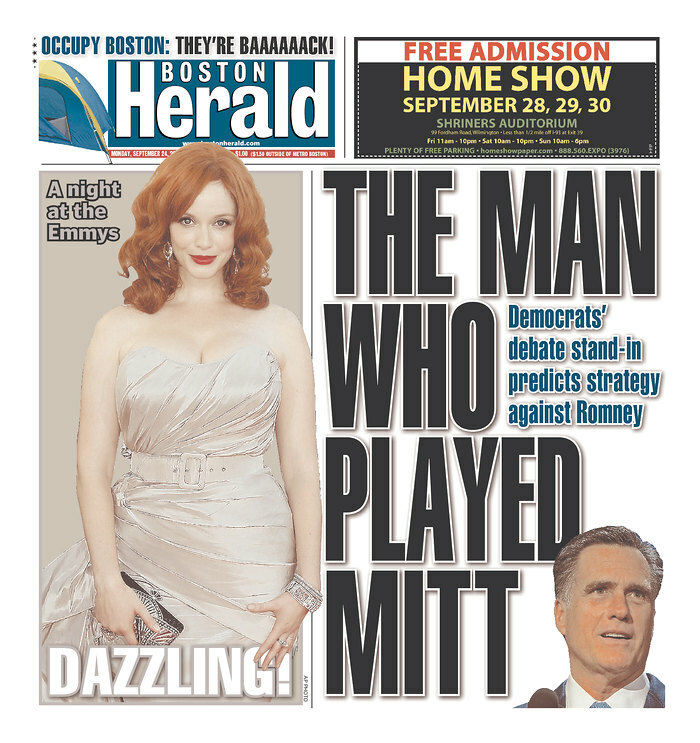 Jeffrey Robbins, a Boston attorney who played the role of Romney as Democrat Shannon O’Brien prepared for the debates in the 2002 Massachusetts governor’s race, divulged for the first time key details of the Democrats’ strategy to turn Romney into “Gordon Gekko” — a strategy that ultimately failed then. Robbins predicts Obama’s debate plan will come right out of the playbook 10 years ago, when Democratic gubernatorial nominee O’Brien tried to reinforce Romney’s image as a greedy, out-of-touch businessman. Bit of a stretch there, eh? Next up is Holly Robichaud’s piece giving advice to Romney. Last week it was great to see an aggressive U.S. Sen. Scott Brown take on Lizzy Warren. After months of her endless whining commercials, Brown called her out on multiple issues — including her fake American Indian status, helping Travelers Insurance avoid paying poisoned asbestos workers and her whopping $350,000 salary for teaching one class at Harvard University. Brown had the right combination of talking directly to voters and discrediting Fauxahontas. He showed how a candidate can remain likable, but still deliver a solid punch. Our former Gov. Mitt Romney would do well to take a page out of this playbook. President Obama is not going to be forced out of the White House if Romney keeps playing defense. It is time to put points on the board. WASHINGTON — The debate season is in full swing, and with it we are seeing the emergence of a nifty approach by some candidates as they prepare to face their rivals face-to-face: avoidance by agreement. The true pioneer of this debate is U.S. Rep. John Tierney who, as the Herald reported, insisted sponsors of two of four scheduled debates with GOP challenger Richard Tisei focus only on certain topics and preclude the participants from asking questions of one another. Of course, this conveniently will allow Tierney to avoid an issue both Tisei and national Republicans have focused on: his in-laws’ gambling ring and his wife’s federal tax-evasion conviction. The hardreading staff would be all for that. 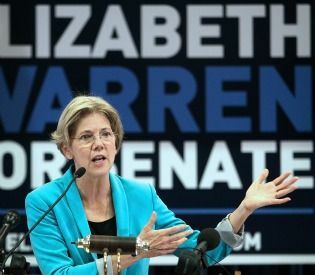 One of the sharpest shots Scott Brown landed on Elizabeth Warren in Thursday night’s Massachusetts U.S. Senate debate concerned her defense of Travelers Insurance in an asbestos case several years ago. 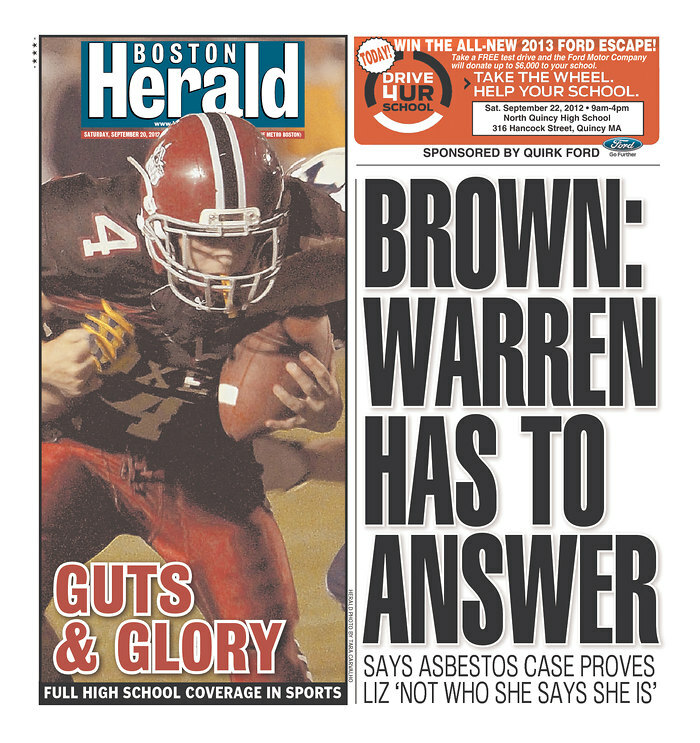 U.S. Sen. Scott Brown said Elizabeth Warren’s refusal to answer questions about her lucrative work defending an insurance giant against asbestos victims will not stand — and vows to hammer her about it in their next debate. The non-response from Warren, who touts herself as a consumer champion, in a Thursday debate has dominated the buzz after the clash. As the Globe reported in May, Warren did represent Travelers in the 2009 asbestos case, but at the time, the company was seeking to unlock a $500 million settlement account for victims, a step many victims supported. After Warren’s work on the case had ended, however, Travelers won a separate court ruling that allowed the company to avoid paying out the settlement. That ruling is under appeal. “Elizabeth Warren got involved to protect the settlement,” against a challenge from another insurance company, said David J. McMorris, a lawyer at Thornton & Naumes in Boston, who represented victims in the case. McMorris and several officials from an asbestos workers’ union showed up outside Brown’s headquarters to defend Warren’s role in the lawsuit. McMorris has donated $467,435 to Democratic politicians, according to the Brown campaign, which sent out a press release about McMorris’s contributions minutes after his comments. Warren has been inexplicably inept in handling this issue. The Herald, on the other hand, has been predictably adept at avoiding both sides of it. You are currently browsing the It's Good to Live in a Two-Daily Town blog archives for September, 2012.